I feel extremely fortunate to be able to continually hone the skills of my passion during every month of the year on both the lands I hunt, and on the lands of my clients. I love writing and speaking about what I do, as well as offering site visits to assist others in doing the same. What began as a love of hunting squirrels in the treetops of southern MI has grown into a passion to assist others in taking from my experiences, both my successes and my failures, while saving hunters hundreds of hours of learning, and thousands of dollars in perfecting their own passion. If you follow my articles or blogs, you will also see that I enjoy sharing and defining all that I know. After many years of “doing business” this way, I have found it to be extremely rewarding. I believe there is a huge amount of value in hiring me to personally arrange the pieces of the hunting and habitat puzzle together specifically for the lands that you hunt. However if you don’t feel the same way or you don’t have the funds for me to help, by all means enjoy watching my videos and reading the info I share for free! Hunting whitetails unguided, on both public and private lands in the states of Michigan, Pennsylvania, Ohio, Wisconsin, Indiana and Kentucky. In 1988 I experienced my first “out of state” hunt, while bowhunting on small private tracts of land in Indiana, and have continued traveling to put to 4 states per year to hunt whitetails. Planting food plots in up to 3 states per year on the lands that I personally hunt. My planting efforts peaked in 2008 with 32 food plots established in 3 states totalling 18 acres; all planted with an ATV sprayer and light drag. An Earthway bag spreader was used to broadcast over 5000 pounds of seed and fertilizer by hand in 2008, and I still seed, lime and fertilize the majority of my fields with ATVs and light food plotting equipment. On my past UP of MI food plots, I applied over 50 tons of lime one 50 pound bag at a time, to what eventually grew to be a total of 8 acres of plantings. Hinge-cutting travel corridors and bedding areas for deer on my own personal hunting grounds, eventually cutting for as many as 25 days in 2013 on my client parcels. Strategic use of game cameras to establish mature buck movement patterns, as well as to establish the core range of specific mature bucks. In 1985, when my 13-year-old brother and I told our parents we wanted bows for Christmas so we could hunt deer, it didn’t come as a surprise to them, even though no one in our family had ever hunted. It was no surprise because we had been raised in a “fishing family”, literally since we were old enough to hold a cane pole. Our annual trip to Michigan’s Upper Peninsula was my motivation for snow shoveling and lawn mowing jobs just to buy a few more lures to chuck at bass or pike during the week of our August vacation. I was receiving subscriptions of hunting and fishing magazines for gifts before I was 10 years old, and at the same time both my mom and grandma learned to be quite good at cooking squirrels shot from our pump BB gun. We learned to lay quietly in the woods at a pretty young age, patiently trying to spy the twitch of an ear, tail, or body of a fox squirrel, sometimes fifty feet above in the branches of mature oaks. During that first year I was able to stumble into a deer while we were hunting, and while I followed the “10 Easy Steps to Field Dress a Deer” from a folded up page of a magazine, my brother dry-heaved off to the side. From those early years we were on our own in the woods, and I quickly developed a passion for gathering as much information as possible to help us be successful. I found that the patterns which applied to the public lands I hunted in my late teens in both lower and upper MI applied to the several small private parcels I hunted in southern MI. I also found they later applied to anywhere else a whitetail roams, whether it was on public or private lands, while laying the foundation for my future profession. Because of my passion for developing hunting land and hunting stand set-ups, I began speaking about it all across MI, and writing about within online hunting forums. Towards the end of 2003, I crafted and submitted my first article to Quality Whitetails, and it was published in the Spring of 2004. Afterwards, I received the National 2004 Al Brothers Deer Manager of the Year award from the QDMA. I had been a member of the QDMA since the late 90s, and when Brian Murphy, the Executive Director, called to inform me of the award I was deeply honored. I knew there were many other landowners across the country that deserved the award as much or more than I, but at the very least it was a reflection of the passion, hard work, and love of everything deer and deer hunting that I had started to develop as a teenager. I found what I have experienced or learned for the most part could not have been taught in a typical classroom, but instead had to be accumulated by spending literally thousands of hours doing everything related to deer hunting in many states and many different types of habitat…over and over again. I actually found that by scouting deer in other states, valuable lessons were learned about my own state. Talking about it, writing about, discussing it and experiencing it on my own has been my best form of education. The woods, swamps and fields have been my best classrooms, whether it has been for my own pursuits or for my client’s. In 1985 if someone would have told me I could made a career of this 20 year later, I would have thought it was an overwhelming daunting task. Why? Because I developed the passion and experience for what I do through the love of deer and deer hunting, and not for a career. What I currently do is to take the decades of pursuing my passion, and then I professionally transfer those pursuits into the enhancement of my client’s hunting and habitat experiences across the country, as well as within the various books and blogs that I type. I pride myself in hunting healthy herds and harvesting does when necessary to maintain a balance with the habitat, as well as by taking on the challenge of hunting the oldest bucks in the neighborhood. I am truly blessed! Not only am I able to own and operate a successful business in the whitetail industry, but I am able to work along side my wife Diane while doing so. Although the website traffic, site visits and book sales continue to increase, the true blessing is the fact that this is a family business. Blessed to be born and raised in a fishing family, I am now proud of the fact that my kids are growing up in a “whitetail family”. 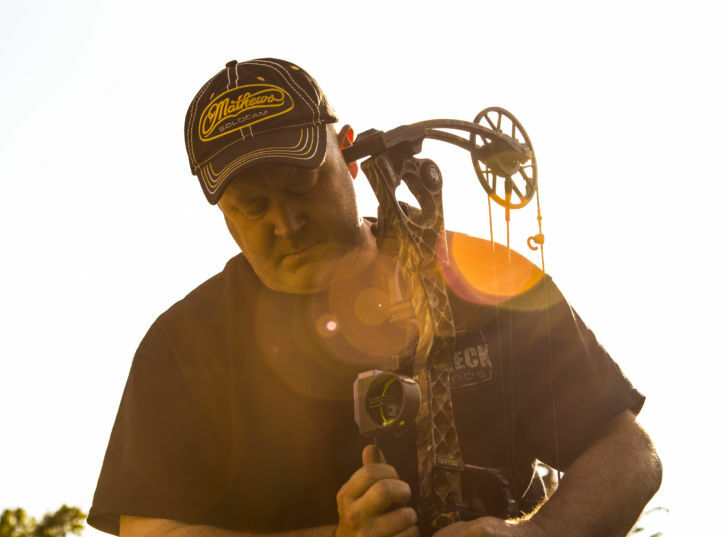 Captured 3 National Championship 3D titles while shooting in both Open and Semi-Pro classes, as well as numerous high level finishes in Open, Semi-Pro and Pro classes while competing in 3D archery, as well as both indoor and outdoor target archery. Competed as a Factory Sponsored Professional archer for Mathews Archery during this time.